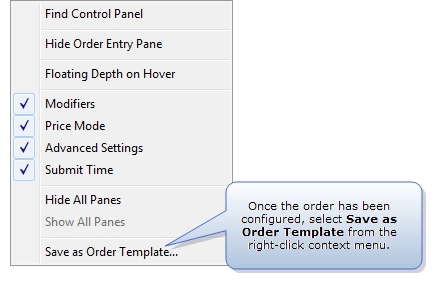 You can save order templates directly from the Order Pane by selecting Save as Order Template from the Order Pane context menu. This launches the Order Defaults window and populates a new row with the settings configured in the Order Pane, including Market, Gateway, Product and Product Type fields. Simply name the template, make any desired modifications, and save the template. You may also want to link the template to a customer profile in the Customer Defaults window so you can seed order entry parameters based upon the customer you select in the trading window. Configure order variables in the Order Pane. Right-click the Order Pane to display the context menu and select Save as Order Template. This launches the Order Defaults window and populates a new row with the order settings displayed in the Order Pane. Name the new order template in the Order Defaults window. Check the SEL field to enable the template.